So we are finally settling into our new house and figuring out the routine. It's starting to feel and function more and more like home and to even look kind of pretty in places. One of the main reasons I ever started blogging was because I wanted to share my home with the world. I love interior design and I love seeing images of what others have done with their spaces. And I've always wanted to be part of that community of diy decorators who put it out there to inspire others. But I have really only ever posted snippets here and there because I've never deemed a space "finished" enough for the world to see. Granted we have moved three times in five years which makes for a pretty tight timeline to come up with the finished product. But I've finally come to accept that there in lies the problem. It's not necessarily so much about the finished product as the fun along the way. Especially with this house. There are so many projects to do, so much furniture and everything else to acquire. It's going to be a long time before even one room, let alone the whole house, is "done". So starting here and now I'm getting over it and taking my blog in a new direction. There will be a lot more interior (and exterior) project and design posts. And because of the age of this house and all of the original surviving features and details it contains combined with its back story (that I have yet to tell here but will get to soon) and my experience in architectural history and historic preservation in the course of working in cultural resource management, we are going to be approaching every "permanent" renovation from a restoration stand point. So that means if it's original to the house and it can be saved, it will be. And if something needs to be replaced, we'll be researching appropriate materials and everything will be in keeping with the house's existing style. So Unknown Blackbird will be taking a bit of a this old house bent. 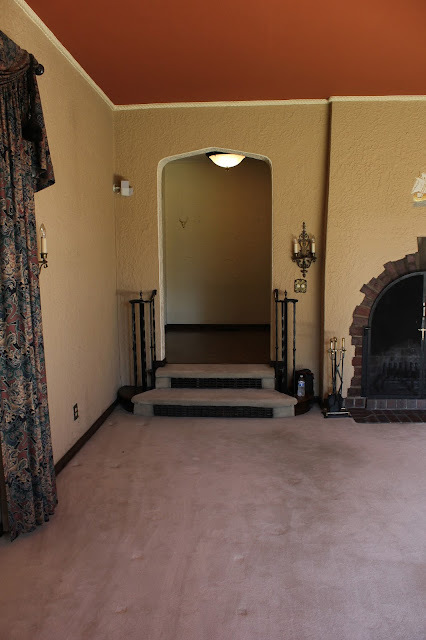 We joked when we bought the place that it might have very well been the set of a John Hughes movie. 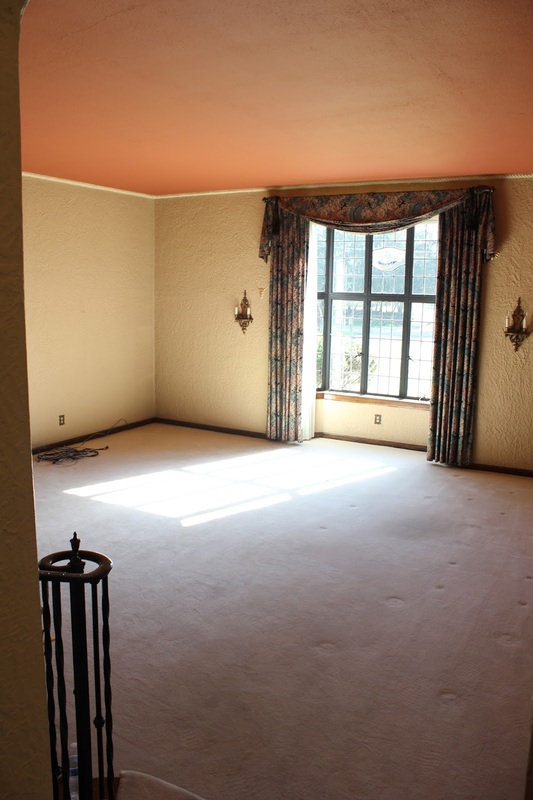 It was last decorated circa 1988 and the living room (dining room too) had the drapes to prove it. We thought for sure that a house built in 1923 would have to have hardwoods under all the carpets (parquet in the case of the foyer, hall and back entry). And upstairs sure enough there was one and a half inch oak strip everywhere. But on the first floor, much to our shock, the only thing we found was the tongue and groove, unfinished, pine subfloor. We finally deemed that the baseboard, though surprisingly short for the height of the ceilings, was original. It's the same throughout the house and in every room the texture on the walls (and we have some heavily textured walls) comes down on top of it with no sign it's ever been filled in after a taller base was removed. On the first floor it sat somewhere between an eight and a quarter inch off the subfloor and had holes from quarter round (shoe mold) being nailed to it previously. The height of the baseboard above the subfloor and the height the shoe mould sat at led us to the conclusion that the living and dining room and the foyer, hall and back entry had originally been carpeted, with something thinner than the modern stuff, more akin to a wall to wall oriental rug, to start with. Eventually this was swapped out for the more thickly padded wall to wall we all know and despise in the living and dining rooms and the quarter round removed. And the parquet was put in the high traffic zone. I will admit that for going on somewhere around twenty years old, the carpet was not in that bad of shape, but the carpet was going on twenty years old. No matter what it might look like, ewwwww. We are not carpet people. Babies and pets and people who drink red wine and are clean freaks don't mix with carpet. 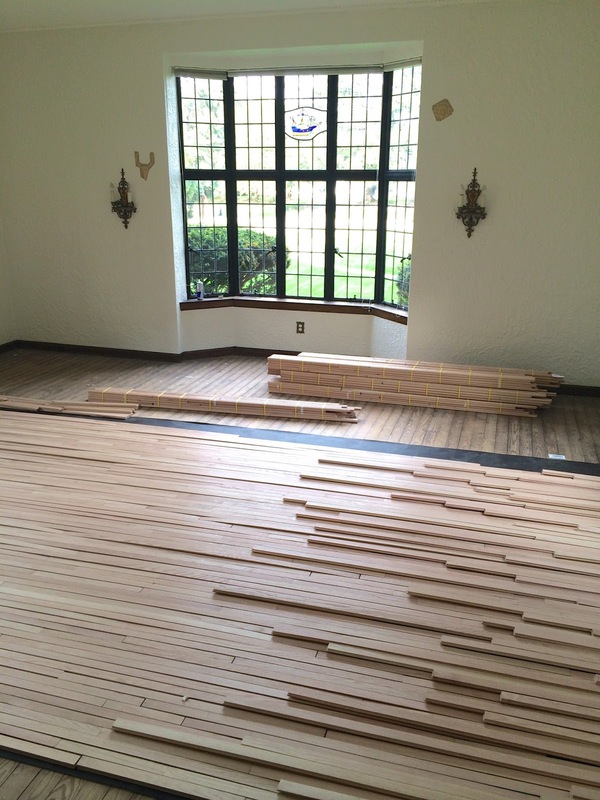 So we decided to invest in hardwoods for the previously carpeted and parqueted areas of the first floor. 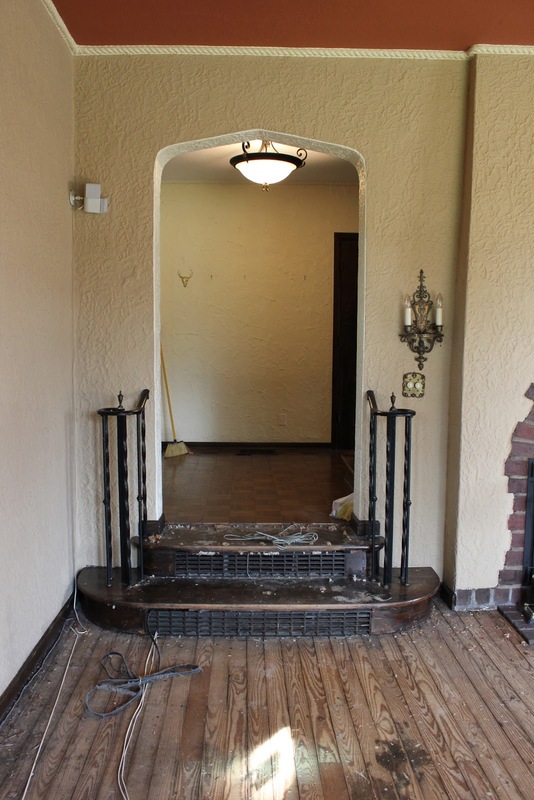 Every house we looked at when we were house hunting was 50 plus years old and if there were original hardwoods, they were the almost invariably one and a half inch oak. And as that was what was upstairs here as well, that's what we went with. In my experience, two inch seems to have been more common, so I am guessing the preponderance of one and a half in the greater Toledo area is due perhaps to regional availability. Maybe a local mill was cranking out the one and a half? Just a guess. 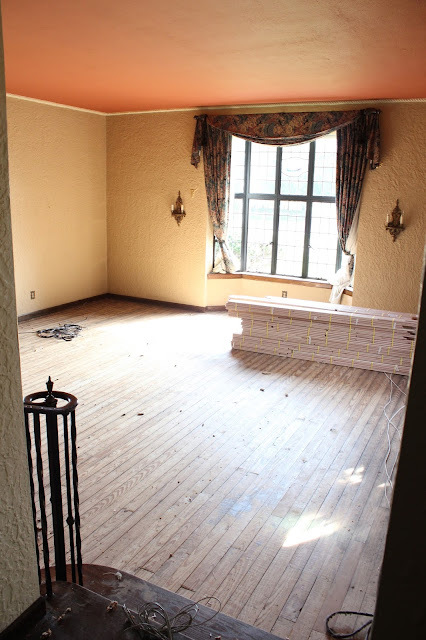 Before the new floors were installed we had the living room painted. I love to paint and if I do say so myself, I'm quite good at it, one thoroughly painted apartment and four houses later. 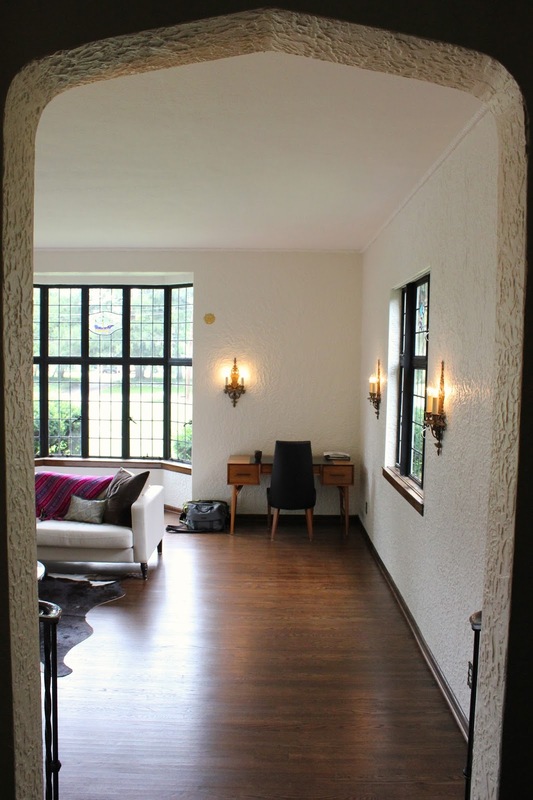 But the size of the room, the ceiling height, the existing terra cotta color of the ceiling, the timeline of the floor project, the taking care of an infant, and our desire to just have this space done when it was time to move in, all combined to make it just make more sense to call in a pro. We used Sattler Painting and they did a very nice job. I am a Benjamin Moore devotee and that's what they use, so that helped solidify the choice. To make the darker floors and woodwork pop out and free me up to use color more liberally when it comes to furniture and accessories I've decided to make all the walls throughout the house Swiss Coffee. It's my favorite Benjamin Moore white. Totally neutral, no undertones, but still nice and warm. 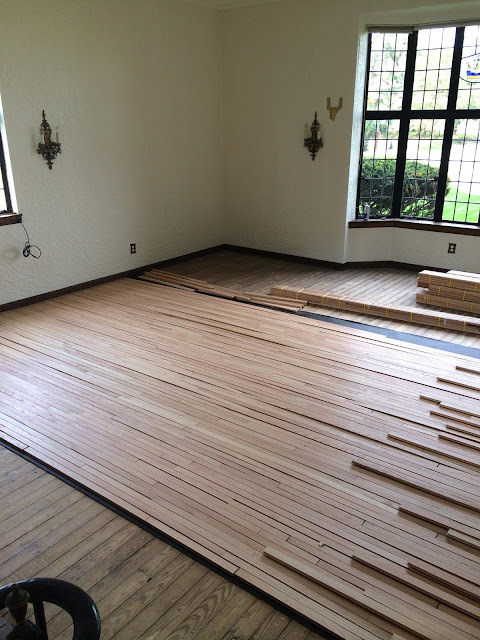 We used Floorcraft Designs for the floors throughout and they did a fantastic job and were easy to work with too. So as it stands now, here's the living room. As I mentioned, we went with a darker stain for the floors (I am not sure of the brand and am forgetting the name of the color at the moment), something that falls in the middle of the various shades of the existing woodwork (all original, unpainted oak) throughout the house. In thinking about how to make the floors on the first floor feel like they belonged, like they'd always been here, beyond just using the inch and a half strip, and in light of some of the high end design choices that were made when the house was built, I started to think maybe doing a little something special was called for. There was of course a budget for this project and there wasn't much extra for the something special. At first I had in mind some kind of border all the way around both the living and dining rooms and maybe a transition of some sort between the dining and foyer, but Michael of Floorcraft steered me towards picture framing the fireplace with the combination of walnut and two and a quarter inch (I believe it is) oak bands, and doing a matching area rug detail in the center of the dining room (I won't try to explain what that is exactly, will do a post on the dining room eventually). And it turned out to be just the thing. While we may still need more and bigger furniture, art, window treatments, (interesting that there is no trim around any of the windows in the house except the sill, they were always meant to be "dressed"), etc, etc, etc, I am pretty proud of how far we've come. So there it is, my first before and after!